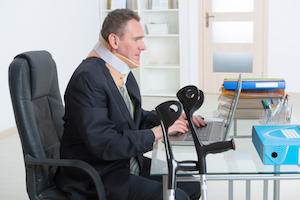 Who is Responsible for Injuries at an Office Building? There are thousands and thousands of offices in South Florida. Chances are that you work in one and visit others. The office buildings vary in size from small units to office complexes and campuses. But if you were seriously injured in an office or in an office building, who would be responsible? The Miami personal injury lawyers at the Wolfson Law Firm can help you. To begin with the simplest area of inquiry, maybe it was bad luck. If not bad luck, maybe it was your fault. You know what happens when most of us are injured in public. We are usually embarrassed. Most people immediately think that they did something wrong. A lot of folks will try to stand up, brush it off and walk away. All of those reactions and emotions are completely normal. But what if the accident and your injury wasn’t your fault? Maybe it is partially your fault, but perhaps someone or some corporation is also responsible. In Florida, the law allows for what is called comparative negligence. Simply stated, a jury can apportion fault for an accident according to the degree of negligence of each party. For example, if you sue two defendants a jury can find you 25% at fault, one defendant 25% at fault and the remaining defendant 50% at fault. If the jury awarded you $100,000 then you would be entitled to recover $75,000 from the defendants according to their respective degrees of negligence. In any office building accident in Miami, West Palm Beach, Fort Lauderdale or anywhere in South Florida a thorough and complete investigation will be needed. In addition, personal injury experts will likely need to be retained. Public records will need to be examined. Your office building accident lawyer will have to develop a list of potential defendants who may bear some responsibility for your injuries and place each one on notice. Insurance policies will be requested and evaluated for coverage and exclusions. Ultimately, demand letters will be sent to each potential defendant in an attempt to settle your personal injury claim. In many cases involving office building injuries caused by the negligence of others, it is the experience of our South Florida accident lawyers that multiple defendants will be involved in any settlement or trial. One reason this is necessary is because of contracts that shift liability and insurance requirements from the building owner to the contractors. It is not unusual for a janitorial company to have a contract with an office building owner to not only clean the office but to also pay for insurance in the event that someone is injured as a result of the janitorial company’s negligence. All too often the additional responsible parties are not identified until after a lawsuit is filed. Once identified, the complaint needs to be amended and all potential defendants need to be added as parties to the lawsuit. Adding defendants is necessary because it eliminates the risk of an “empty chair” defense at trial. That defense is basically one or more defendants pointing to some other responsible party who is not a defendant as being at fault for your injuries and damages. At the Wolfson Law Firm, our Miami personal injury lawyers can assist you if you were injured in any type of office or building. We have helped personal injury clients since 1963 and we are ready to answer your questions. Just call us today for your free consultation at (855) 982-2067. Our South Florida accident attorneys proudly serve the good folks of South Florida including those who live or work in Miami, Aventura, Hialeah, Coral Gables, Kendall, Hollywood, Pembroke Pines, Weston, Miramar, Fort Lauderdale, Plantation, Deerfield Beach, Boca Raton, West Palm Beach and Palm Beach Gardens.